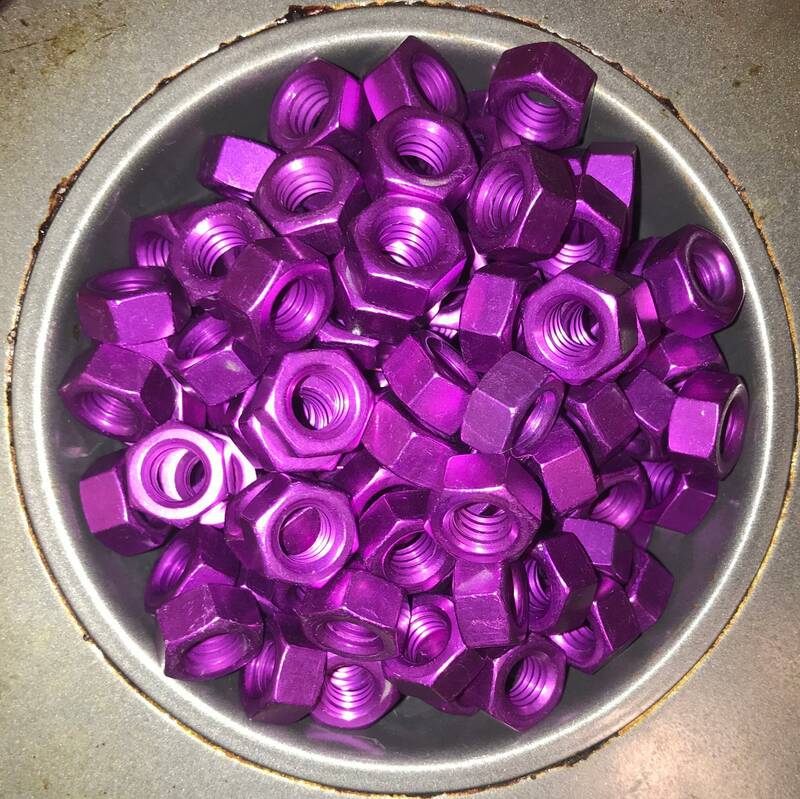 Anodized Colored Aluminum Hex Nut 5/16-18 Purple, Green, Blue, Red, & Brown. NOTICE: PINK IS CURRENTLY OUT OF STOCK! ONLY COLORS AVAILABLE NOW ARE RED, BLUE, PURPLE, GREEN & BROWN. 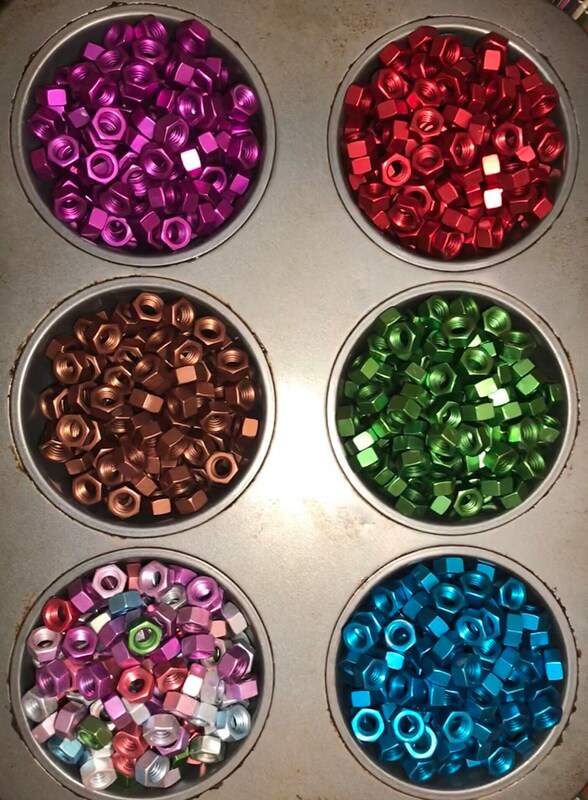 Buying (1) = qty of 100 Anodized Colored Aluminum Green, Purple, Blue, Red & Brown Hex Nuts; 100 DIVIDED BY 5 of each color is qty 20 or by 4 colors and it’s 25 of each color or 2 colors at qty 50 each. 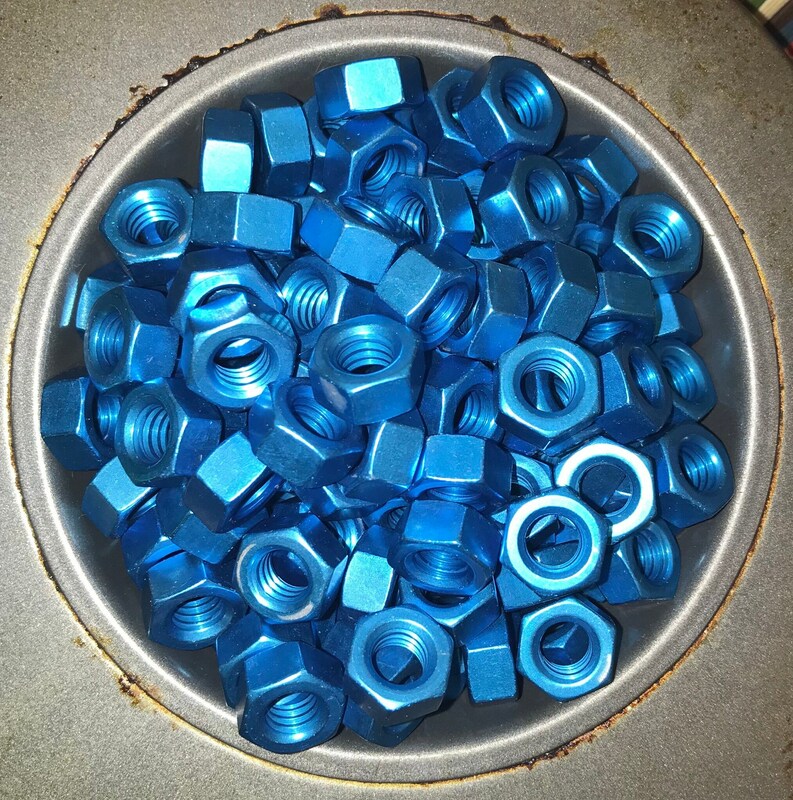 These are Aluminum Anodized colored 5/16-18 hex nuts. 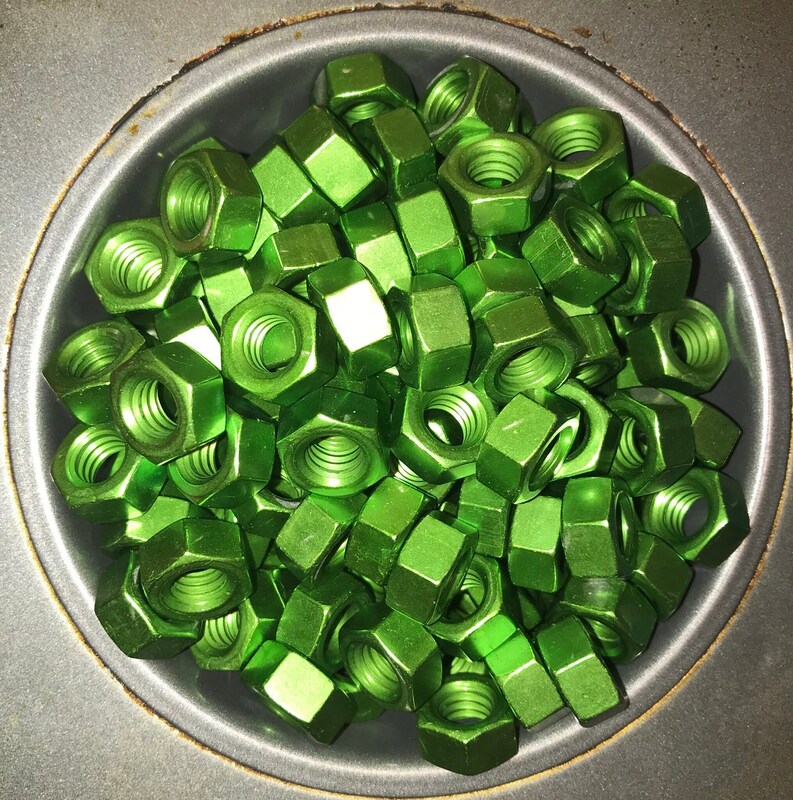 Custom made Green, Purple, Blue, Red & Brown Anodized Colored Aluminum Hex Nut size 5/16-18. Item is sold in increments of 100 only. If you want 200, choose qty of 2 and for 300 choose qty of 3 and so on. Shipping is $7.50 up to qty 700. Anything higher than that will increase shipping amount. Please send me a message if you want qtys greater than 700 and I will set a custom item up for you showing adjusted shipping costs. Item is sold in increments of 100 only but you can mix and match colors however you want in your count as long as final order equals 100 per each "1 item" you order. NOTE: You can also select 50/50, 5x20 or 4/25 and tell me in a message during ordering what colors you want in those quantities. Example: 50/50 would be qty 50 of one color you choose and 50 of another color you choose. 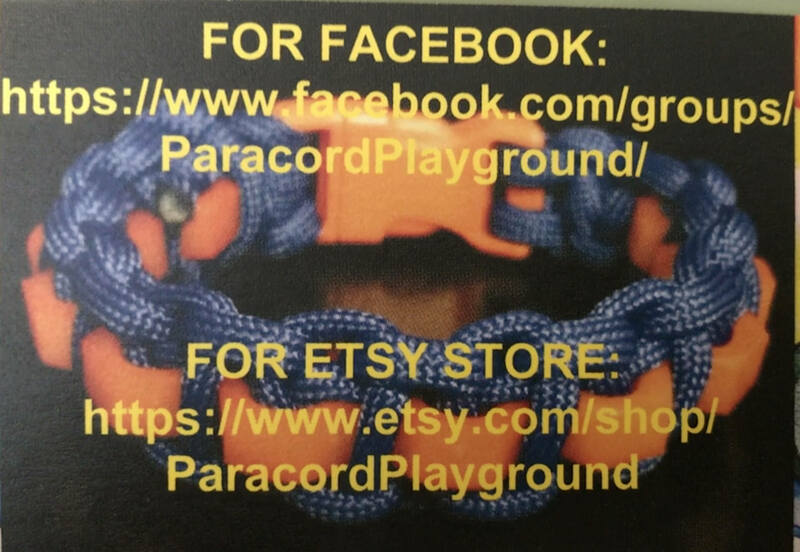 5x20 would be choosing 5 colors with qty 20 each. 4x25 would be choosing 4 colors with qty 25 each. NOTE: THESE ARE VERY DEEP OR STRONG IN THEIR COLORS. 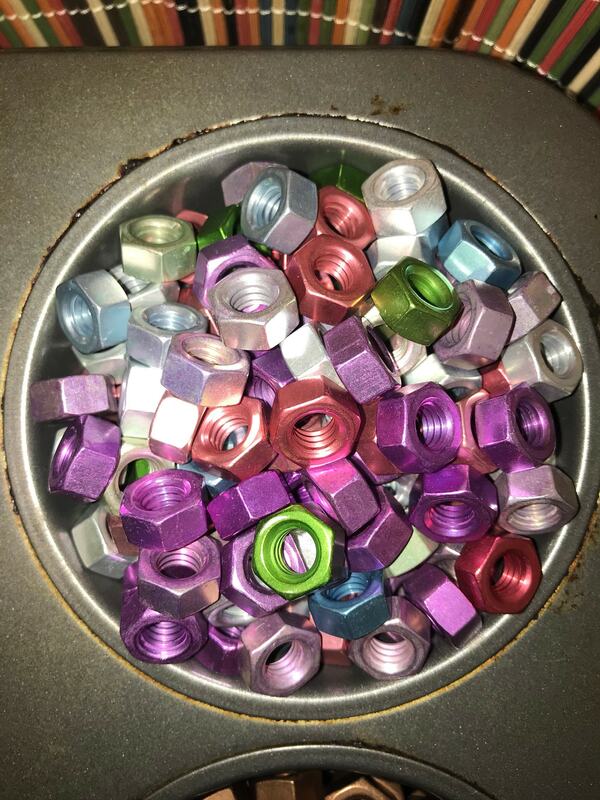 IF YOU ARE LOOKING FOR A MORE SOFTER HUE OR TINT OF THESE COLORS, CHECK OUT OUR OTHER STORE ITEM "PASTEL COLORED" NYLON HEX NUTS. If no specific notes or message is received and you choose "Mixed - Even Mix All" as your option, it will be up to the discretion of the order fulfillment department how the break down quantities will be, as long as they add ups to your purchased total, and they will be as even of a count as possible. 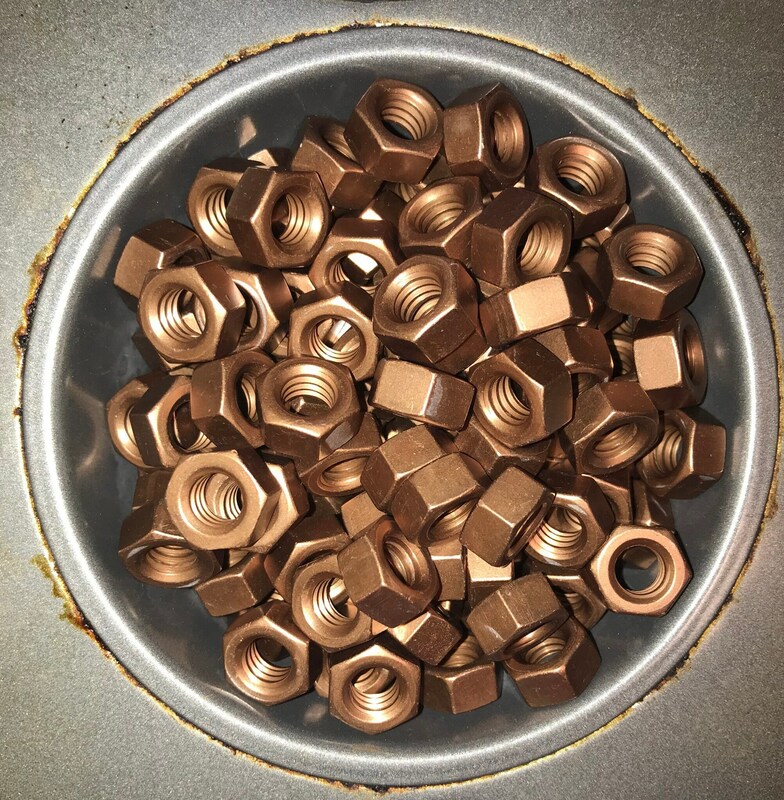 NOTE: WHITE IS NOT AN AVAILABLE COLOR WITH ANODIZED COLORED ALUMINUM HEX NUTS. 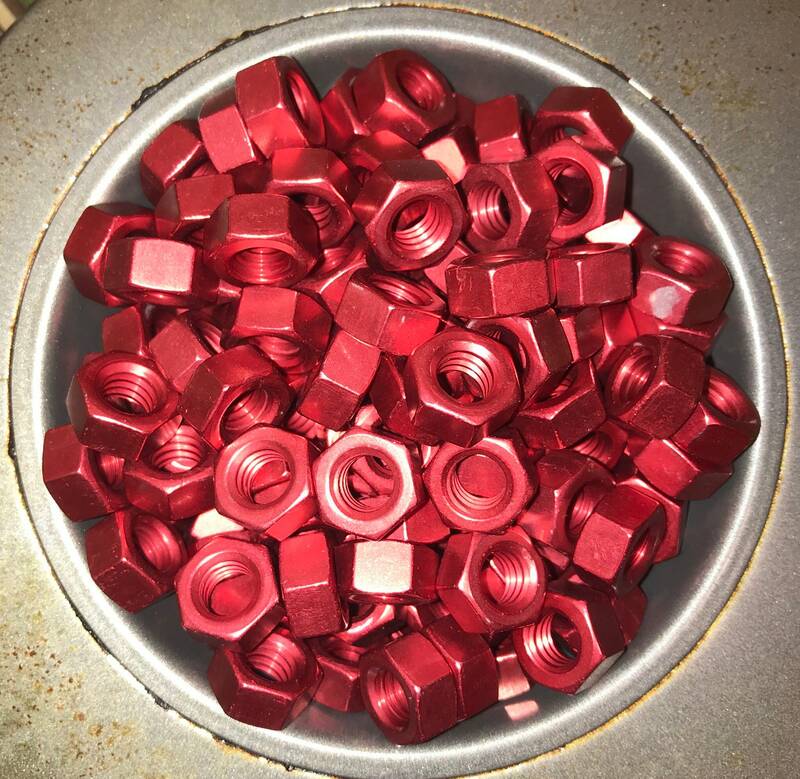 IF YOU WANT A WHITE HEX NUT, PLEASE SEE OUR COLORED NYLON HEX NUT OPTIONS, AS WHITE IS AVAILABLE AS A NYLON HEX NUT.